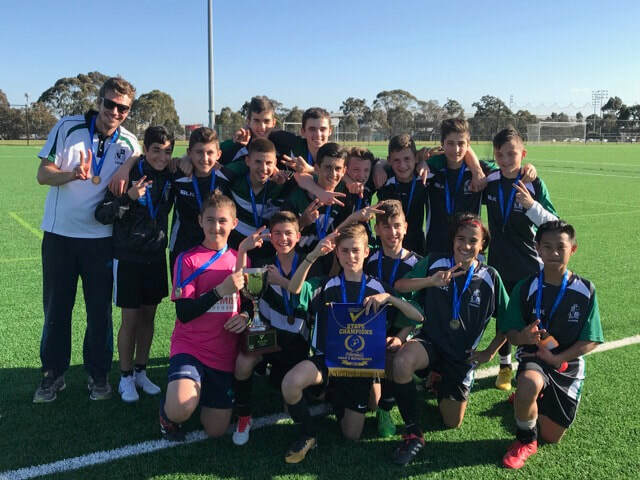 The Yr 8 boys soccer team became State Champions on the 13/9/2018. The boys had a tough group and start to the State Finals as they had to play John Fawkner first and played extremely well but unfortunately could not get the much deserved break through and it finished 0-0. We then played Bendigo South East and needed a victory to increase our chances of progressing to the final. Bendigo were very hard to break down as they “parked the bus” but we eventually got the break through to win 1-0. With John Fawkner also winning and level on points with Strathmore, it meant that it was all to play for in the last game. We played a school from Albury and the boys played some outstanding soccer to win 7-0 enabling us to go through to the final against Rowville. It was a tough game as both teams were clearly fatigued and Rowville taking advantage of that by scoring an early goal, however we equalised immediately and then scored in the second half and the boys had the skill and professionalism to see out the game. This meant they went back to back State Champions as they were State Champions as Yr 7’s, and the first time this has happened at SSC in soccer.